My father grew up on the South Shore of Massachusetts, about 20 miles southeast of Boston, in the quaint sailing town of Cohasset. When he wasn’t repainting the family sailboat or riding bikes into town, he was trading baseball cards. Back then, it wasn’t about making a profit. It was all about out collecting your favorite players—Red Sox players. So why did a Red Sox fanatic have the Mickey Mantle card? He’s not wrong. As a kid, I was obsessed with collecting cards. Baseball, basketball, football ... it didn’t matter. It got so intense that as a 12-year-old I’d rent table space at card shows in the area to showcase my collection and barter or sell my cards for a profit. So when my father told me about his collection back then, dollar signs flashed before my eyes. I insisted we drop everything and take an inventory. And we did. I was in awe. The hits kept coming. Mantle, Koufax, Yastrzemski, Ted Williams, Willie Mays. 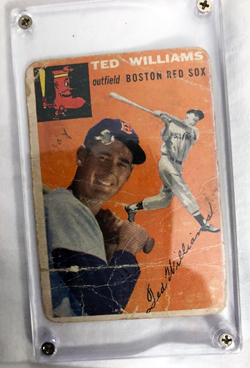 Here’s one of Dad’s Ted Williams card—with a BB gun hole through his head! Clearly a Yankee fan got ahold of this one. It was a matter of instinct for my father to practice the value investment discipline (even if he had no idea about the term at the time). Buy quality assets at inexpensive prices and wait for the market to recognize the value. My father’s collection took decades for true value to be recognized. When I first ran an inventory of his collection, several cards were worth thousands each. Some above ten thousand. But it took decades! Value investing seems pretty straightforward, but it takes a lot of work. And it takes a lot of waiting. Waiting for Mr. Market is the hardest part. How do I know? At CastleKeep, we tend to be value oriented. Over time, value investing works. Just ask Ben Graham, David Dodd, Buffett, Munger, Gabelli, Bill Miller, Royce, and the recently deceased Marty Whitman. If you don’t know these names, look them up. They’ve delivered outstanding results over time by following the value discipline and sticking to their knitting when value goes out of favor. I realize there is no “one size fits all” for value criteria. 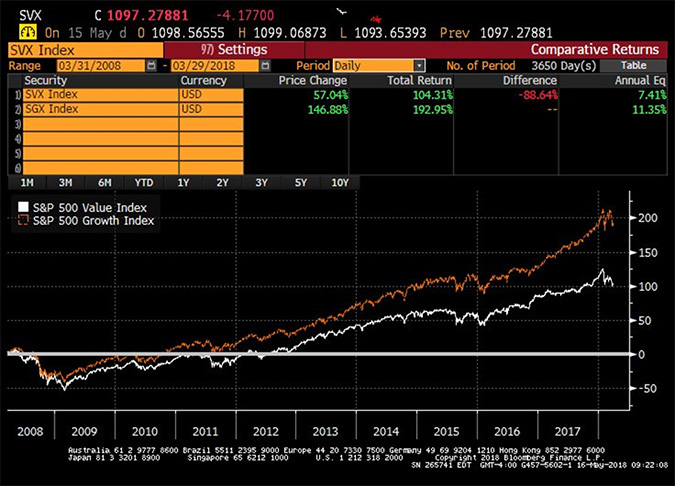 But the graph above shows that, as represented by the S&P 500 Value Index, it’s been a tough environment for value investors over the last 10 years. Look at how the orange line (S&P 500 Growth Index) has diverged from the white line. Over the last ten years ending March 31, 2018, the S&P 500 Growth index has outperformed the S&P 500 Value index by nearly 4% per year. Compounded annually, that’s a difference of nearly 90%! And this wouldn’t be the first time. There have been many times in the past where value investing was declared dead, only to come back to life. Over and over again, folks claimed the future was in growth companies and that value would never come back. There were the “Nifty Fifty” years (1960s and 1970s), the Dotcom Bubble, and now today’s FANG phenomenon. Growth stocks have had a heck of a run, led by technology companies. Investors as of late seem to care more about growing revenue versus actual profits. There’s a big difference between the two. Tesla’s revenues increased by $4.8 billion from 2016 to 2017—an increase of 68%. But so did their operating losses. In 2016, Tesla lost $667 million. In 2017, those losses climbed to $1.63 billion. Their losses more than doubled yet the stock was up 45% in 2017. When you boil it down, stock investing is paying a certain price for a share of a company with the expectation that the company’s future earnings will return more money than the price paid over time. To earn money back, the company must have earnings. And right now, Mr. Market, as evidenced shares of Tesla’s, seems to care more about growth of revenues, regardless of profits (or losses). That will change. Profits and retained earnings are what should matter over the long run. Mantle’s rookie card would be worth virtually nothing if he didn’t post Hall of Fame numbers! Value investing is hard. 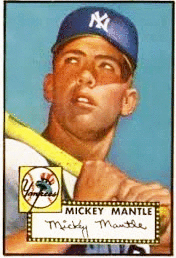 The trick is to buy Mantle’s rookie card for what Red Sox fans think it’s worth, then eventually sell it for what Yankee fans think it’s worth. And this can take decades. Now if you’ll excuse me, I’m off to kidnap my father and hunt down that Mantle card!